PALM DESERT, Calif. -- When you come to the Marriott's Shadow Ridge Golf Course you not only have the chance to play one of California's premier golf layouts, designed by Nick Faldo with help from Lee Schmidt and Brian Curley, but you also can sharpen your game with some of the best golf instructors of the Faldo Golf Institute. The Faldo Golf Institute offers programs aimed to match each type of player, from experts to women to kids. Mike Ellis -- senior golf instructor and my easy-going, two-day teacher -- made me immediately feel at ease and promoted a professional, knowledgeable and calm atmosphere to address my flat, inside swing pattern. He gave me several practice drills to become more upright -- like Faldo. And Ellis should know what works and what doesn't work. Ellis will never forget the day Faldo sent him a new student to look at and appraise. Her name was Yani Tseng and she was 15. "I took her out to the pitching area where we have an area that is shaped like an upside down V with various lengths of pin placements," Ellis remembered. "After we finished there were balls closely surrounding all the pins. I knew she could be something special." Ellis kept in touch, and after Tseng had qualified and missed the cut in 2005 at the U.S. Women's Open at Cherry Hills he called her. "I only cry (sic) one hour," Tseng told Ellis. Reversely, when Tseng won the 2004 U.S. Women's Public Links title she told Ellis, "that time I make Michelle Wie cry." Needless to say, Tseng, the top-ranked women's player in the world, doesn't shed many tears these days. "My first goal is to make the student feel comfortable," Ellis said. "I found my niche quickly, started teaching right out of college 29 years ago, and when I joined the Faldo Golf Institute I discovered Mr. Faldo's philosophy was to have fun learning the fundamentals. We don't have a cookie-cutter approach because we know everyone has a different swing and we try to give tips and drills to improve on it. "The most important thing to me is to see a student improve -- that's what keeps me going in the teaching industry. I always try to make someone feel comfortable -- set them at ease and the learning experience is much better. Fun is first, and if you walk away with some things to work on your game, have a good experience and start to hit the ball better then everyone is happy." Faldo, a six-time major champion, has an extensive certification process for his instructions and they all spend time with him as part of their training. The Faldo Golf Institute offers programs aimed to match each type of player, from experts to women to kids. The curriculum is flexible to ensure learning is paced for each student and goals are established for improvement with specific practice regimens and developmental drills. Ellis' instruction for me included putting grip and alignment, short-game chipping and pitching, sand tips, irons and driver drills, and video documentation which was emailed to me after my two days along with Ellis' audio comments. Correcting years of bringing the club too inside can't be corrected in two days, but Ellis was able to show me improvement from day one to the second day. At one point on the range we took a break and Ellis looked up at the view from the backside of the range, peering at the panorama of the snow-capped peaks of the San Jacinto, Santa Rosa and San Gorgonio mountains on an ideal 80-degree March day. "Not a bad office," Ellis said. True, and the view, weather, practice facilities and Faldo's Shadow Ridge Golf Course and time-share Villas made it even more of an excellent experience. Faldo Golf Institute: What else is included? Faldo believes club fitting will take your game to the next level and the Faldo Golf Institute includes a Club Fitter's Workshop and Trackman, which is a precision swing and ball flight analysis. TrackMan uses Doppler radar -- the same technology employed by the military for tracking missiles -- to analyze the golf swing and entire flight of the ball from impact to landing: displaying the ball's 3D trajectory in real time, while delivering 22 swing and ball flight parameters/data points on every shot. Also included is the Alumni Clubhouse, where you can login to information about new instruction videos and even access your videos at www.gofaldo.com. Book a two- or three-day golf school and don't pay lodging package pricing. 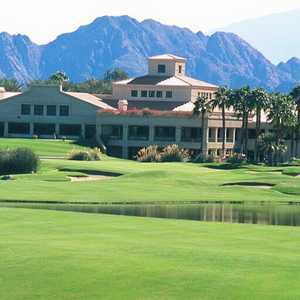 Just pay regular pricing for the Golf School and the lodging is free in Marriott's Grande Vista resort in Orlando, Fla., or Marriott's Shadow Ridge resort in Palm Desert, Calif.